I’ve written several articles about community gardens – the benefits and how to’s – but once you have your plot of land and an interested bunch of people who want to grow food, it’s important vital, to provide some basic equipment for the gardeners and tutors to use. Without a few tools the group will struggle and far from the success you envisaged at the beginning of the project, you could find it falters and folds. Willing or Not So Willing Volunteers? If the initial core group are willing volunteers, you may get away with asking them to bring their own equipment until funds have developed. However, if you’re a well-meaning organisation who are trying to encourage low-income families to start growing their own in community gardens, even if your ethos is one of upcycling and recycling, you’ll need to provide some basic kit. Your potential gardeners might not have the equipment or the funds to buy the tools, seeds or gloves that will start them on the road to growing more of their own food and without it, will soon lose interest. The Community Garden Twitter & Facebook pages recently received the following query which prompted me to write this post, sharing some of my experiences from projects I’ve worked with. 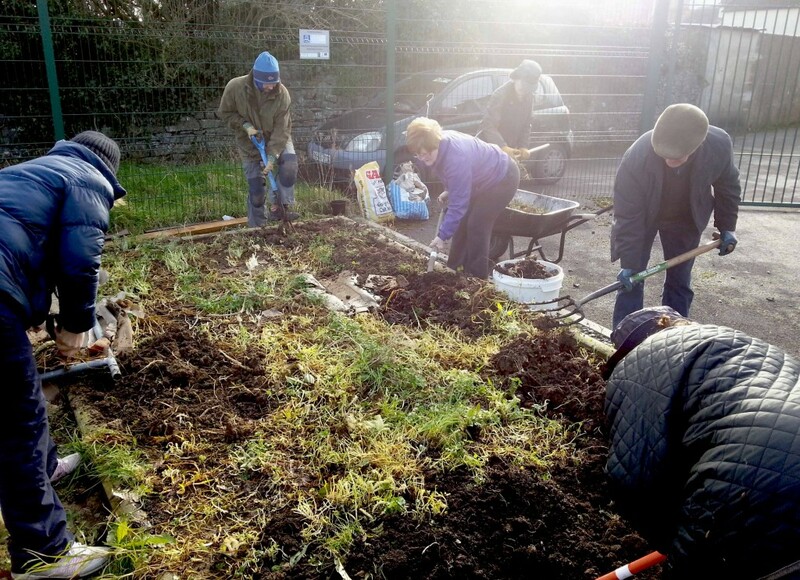 Post by Ardee Community Garden Project. Do I Need To Harvest Water or Have An Electricity Supply? I’d be interested in reading your experiences in the comments below, but my own are that groups can manage without electricity but gardening can be difficult, though not impossible, without water on tap. None of the gardens I’ve worked with have had a power supply in the garden itself, though some have run extension leads from buildings nearby for power tools. Although a heated propagator bench is a very useful addition to any polytunnel, I’m not aware of a garden having one where the group only meets once a week. 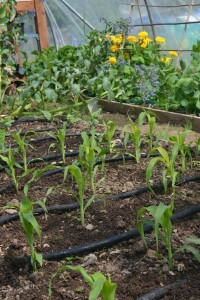 Water harvesting can vary but community gardens are a good place to demonstrate how it can be done. It makes sense to save water. It’s a free resource with no chemicals added and although it might seem like we have a lot of rain in Ireland, we can experience some long dry spells. If you don’t have a mains water supply on site, harvested water might be your only source of water. Some gardens have standard rain barrels attached to roof guttering, some have old builders tanks rigged up to catch rainwater with a funnel, some sink their own wells. In the Greenside Up garden we attached a couple of leaky hoses to a builders tank connected to our roof guttering. This has worked really well for us and I would definitely recommend trying to install something similar in a community garden environment if you can. You can read more about our system here. So you have water and possibly electricity, what else do you need in a community garden? Before we move on to the must haves and optional extras, it’s a good idea to think about toilet facilities. They might not be a necessity but will be needed by someone at some point! If there’s no toilet block on site, consider installing a composting toilet, hiring a portaloo, or have a chat with the closest pub or business and ask if they mind gardeners using their facilities. If you don’t have a polytunnel or shed, a pop-up gazebo would be a useful addition to the kit list. I’ve been in several gardens where a downpour of cold rain in February has sent everyone running to their cars. By the time they’ve started their engines and gone home, the sun was out and the rain stopped. Note: Quantities will differ depending upon the size of garden or group expected. Seeds/sets/tubers – discuss with the group what they’d like to grow. In the meantime, here’s my recommendations for 14 vegetables to get you started. Soil/Raised beds – digging straight into the soil is the cheapest method and perhaps the most sustainable, but not always the most practical for a community garden. The soil might be contaminated, full of rubble or may not be fertile, you may want higher beds for people with mobility issues and there’s no doubt they’re a lot easier to maintain for a group environment. Don’t forget that if you’re creating raised beds, you’ll need to source good topsoil. Garden tools – you’ll need a minimum of a fork, garden (flat) rake, spade, hoe. Hand tools – small trowel, fork and a small hand hoe/weeder. Gloves – either provide them or ask gardeners to bring their own. I swear by Showa gloves. Waterbutt/water source – You might get away without a running water supply outside if there isn’t a long dry spell of weather, but vegetables will grow a lot bigger and tastier if they’re not left to parch. If you don’t have an outside tap nearby but have a shed or building close to your garden, plan to connect waterbutt’s where you can – it’s a free resource once you’ve made the initial outlay. Watering can and/or hose for the above. Horticultural fleece – for covering vegetables in case of a sudden frost. Bamboo poles/hazel sticks of various sizes for pea and bean supports. String – take a look at this “what’s in the tool bag’ post for more ideas. 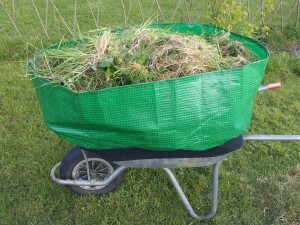 Compost Heap – make your own with pallets or buy a plastic one from the local council, but composting in a community garden is a must. It will become a source of organic matter for you in the future. Manure/Organic Matter – buy in or find a friendly farmer who can supply you with some well-rotted manure. Seating – make your own, buy or look for donations but the social side of community gardening is one of the top two reasons people join them. Seed/propagation Trays and Pots – see ‘start collecting’ below. Seed & Potting Compost for starting seedlings off, preferably reduced peat. Shed for keeping the tools securely locked away. 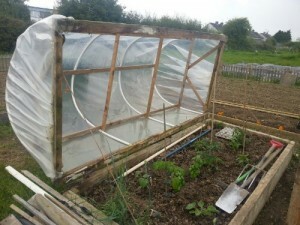 Polytunnel – the bigger the better. Can also be used as an indoor classroom. Here’s some tips on what to choose. Grow bags and buckets/tubs – if your beds aren’t ready, or you simply want some extra growing areas, grow bags can be useful for planting outdoor tomatoes, strawberries or cucumbers. Cloches – great for beginning and end of season as well as growing warmer climate veg if you don’t have a polytunnel. You can make your own or buy them ready-made. Community gardens are really good environments for encouraging people to think creatively about reusing and upcycling, both of which can help to keep the costs down too. Cardboard toilet/kitchen roll tubes are handy for growing seeds in. Plastic food containers make great seed trays or pot containers. Plastic plant pots – ask local garden centres for spares. Carpet can be used as the base for garden paths if you’re planning to wood chip over them. Cardboard boxes – can be put on the bottom of raised beds to prevent weeds coming up. 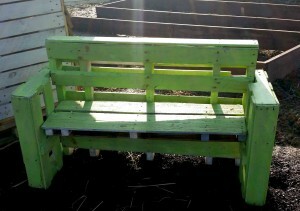 Take a look at my Recycled Garden Pinterest board for some more ideas. 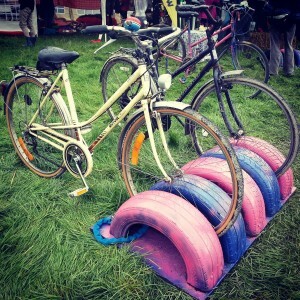 Follow Dee Sewell ‘s board Recycled Garden on Pinterest. If you don’t have immediate funds, there are various ways of obtaining small grants or donations though it’s a good idea to choose someone in the group to take care of this. If you need cash to pay for tools and equipment, you may need to fund raise or ask local business’ if they’ll sponsor more expensive details of the garden such as a polytunnel. You could try sending out a plea in your local newspaper, Facebook post or parish newsletter. 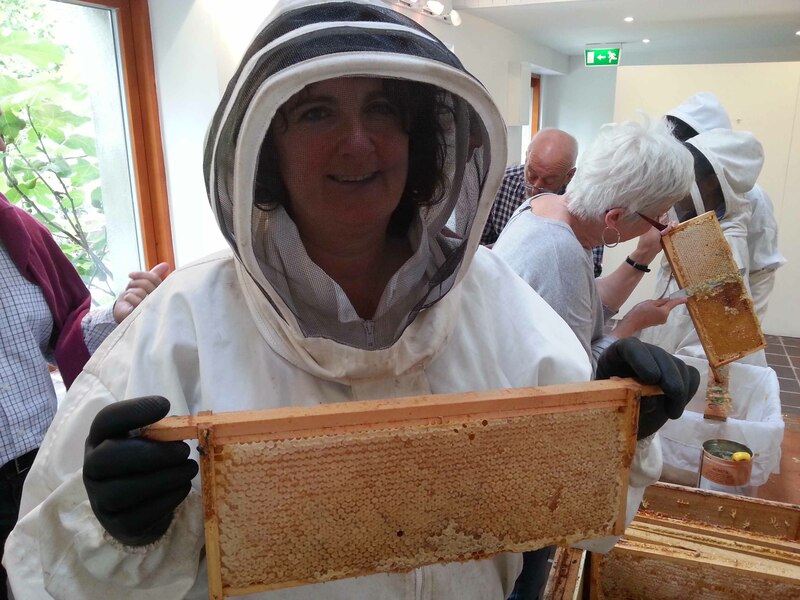 Keep an eye out too for occasional grants being offered by groups such as GIY International (if you’re in Ireland be sure to join the community garden network for updates). Contact your local council or tidy towns group for advice and ask if they know of any small pots of gold that you can tap into or ask other community gardeners either in the forum group or on twitter or Facebook. Local training offices (ETB’s) might also be able to offer advice and definitely speak to them about the availability of horticultural tutors. There’s a wealth of knowledge out there if you ask. Community gardens don’t just have to attract hardened gardeners. Youth groups, artists, people with disabilities, the elderly and socially excluded can all be encouraged to visit and take part, widening the reach within communities. If you’re involved with community gardens, have you any more tips to add that can help to get them started? I save my loo rolls for runner beans. I like the old carpet idea – may give that a try as the walk up to my compost heap gets very weedy. Loo rolls are great for beans as they don’t like their roots being disturbed. We carpeted an entire community garden in Goresbridge with donated offcuts before adding woodchip. It transformed it and the weeds couldn’t find their way through! 15,000 Free Trees! Will You Find Love Among Them?